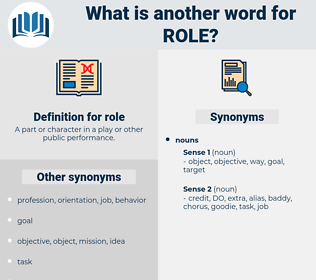 What is another word for role? A part or character in a play or other public performance. powers, helps, patterns, Templates, skills, servants, designs, media, figures, events, function, functions, ROL, Rolle. implications, counterparts, protagonists, Capacities, reviewers, leads, returns, artists, heads, sheets, powers, LINEs, servants, media, functions. ministers, data, factor, function, ROL, difference, effect, characterization, role-playing, presence, mantle. stressed, noted, said, added, functions. concerned, charged, scheduled, Tasked, recognised, measured, tailored, integrated, implicated, organized, reinstated, utilized, determined, supposed, played, published, presented, printed, needed, related, engaged, designed, aligned, defined, adjusted, expected, guided, Carried, adapted, attached, driven, intended, linked, called, raised, done, based. contributors, actors, players, Plays, Characters. He affected great dignity, and filled his role to perfection. Yet an experiment successfully conducted by Castle and Phillips will indicate, even to those who have no special knowledge of the mechanism of heredity, the important role the ovum plays. real, rely, riyal, relay, rail, rial, riel, rile, rill, riley, roelle, railway, rule, raw wool, ROL, roil, royal, Rolle, rollo, reheel, roily, rally, ROEHL, rouleau, raoulia, rale, rowel, roll, really, roell, rarely, rural, ruly, royally, rohl, reel. 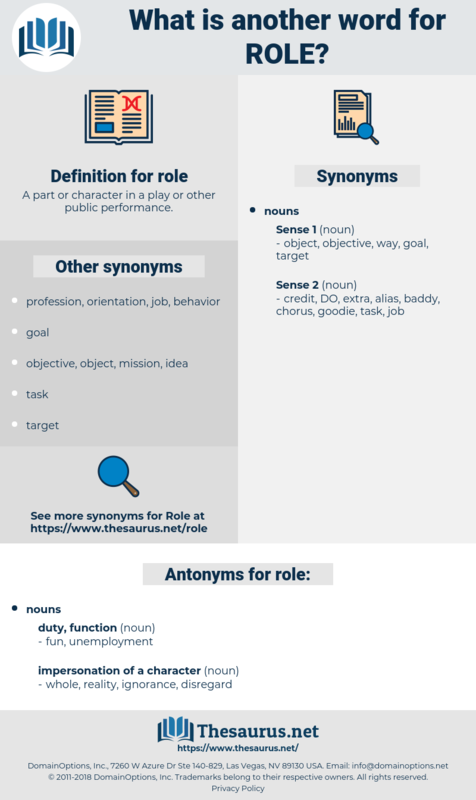 hat, position, lieu, capacity, stead, gender role, second fiddle, portfolio, place.